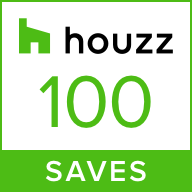 Our clients had only recently moved in at the start of this project. They were keen to create an elegant space for cooking, relaxing and entertaining. Together with the kitchen, they wanted the utility room overhauled to match the main space and to build in plenty of storage. 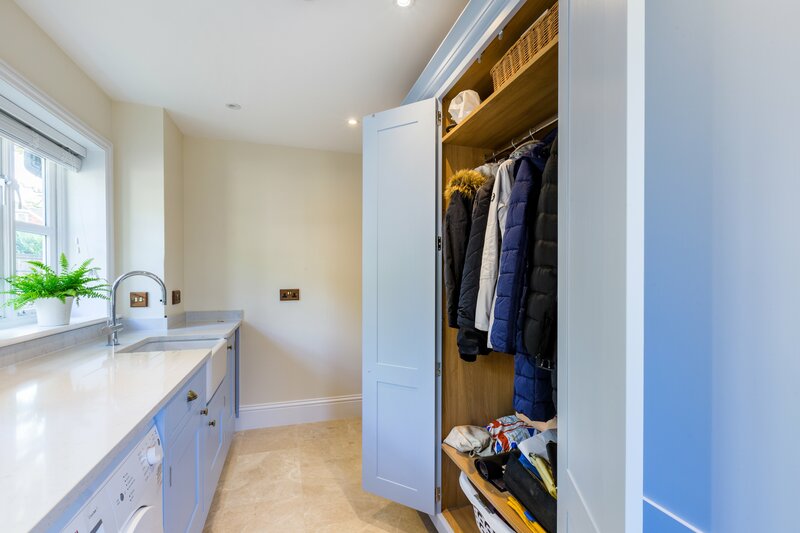 Creating a really colour coordinated look and feel, using a pale blue shaker kitchen design was a priority. In addition, the design needed to incorporate the existing aga and butler sink. Lastly they wanted a kitchen island and it needed to be large enough to sit and work at. For this style of house with its traditional features, we designed a classic shaker style kitchen. 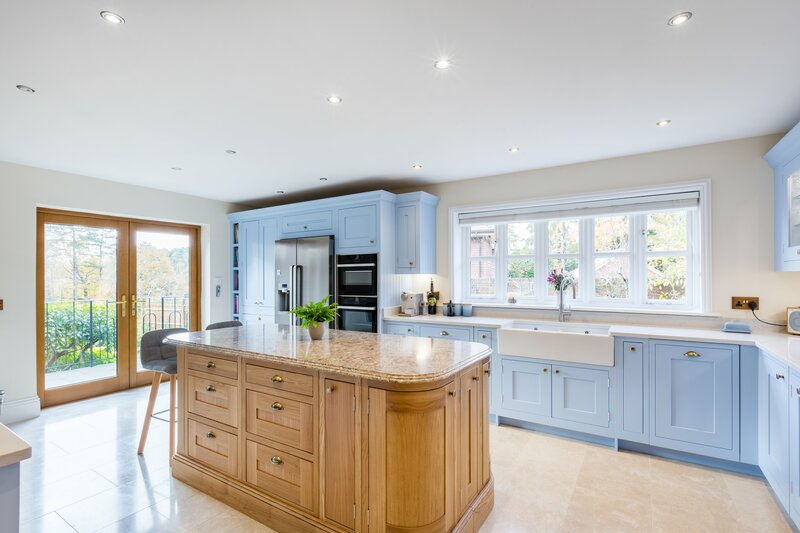 The lovely pastel blue shade was chosen by our clients and brings the classic shaker right up to date. The soft, pale tones keeps the space light and bright with a timeless quality. 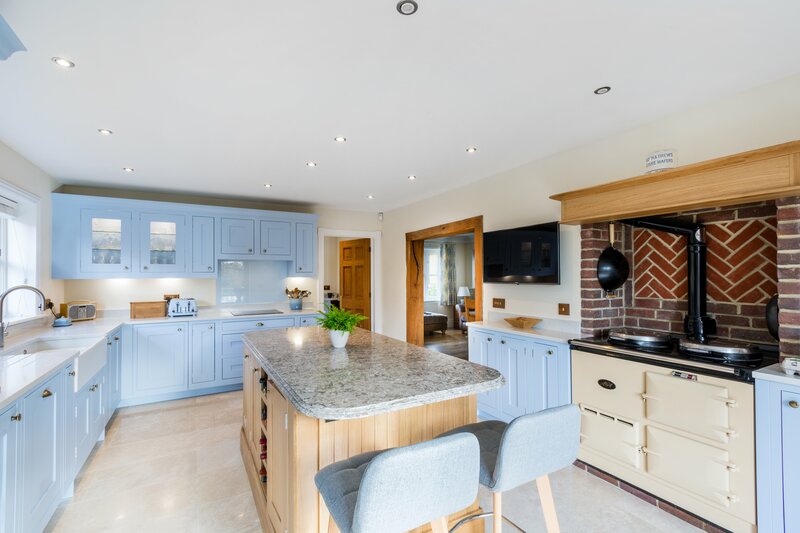 To create a contrast to the blue, our clients were keen to introduce another colour into the kitchen. The island was the ideal choice to create this contrast. However, instead of opting for an alternative paint finish, we took inspiration from the rest of the home and our clients love for coordination. The adjoining dining room features an oak dining table and chairs, so we recommended an oak kitchen island. This creates a real coherency between the two spaces. The whole look is brought together with a Konigstone Quartz worktop, which contrasts with a Granite worktop on the island. The contemporary Quooker tap and classic Limestone floor further complete the look. 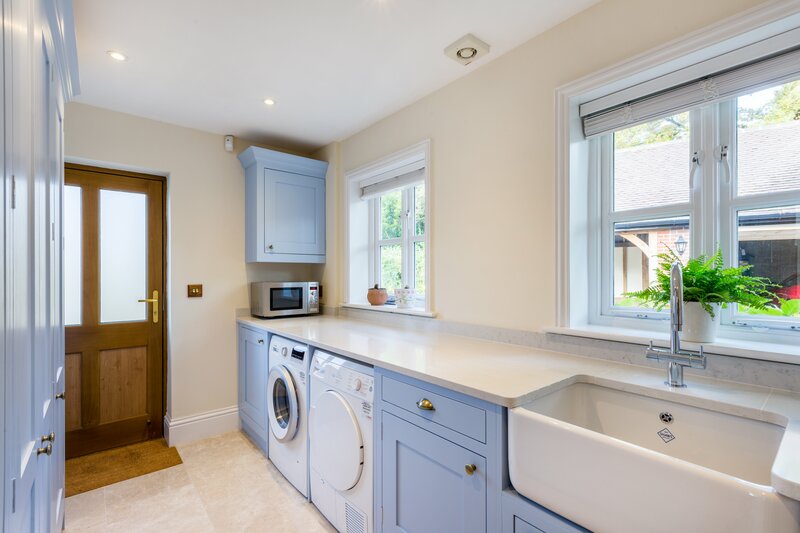 Colour coordination and coherency was really important to our client’s vision so we colour matched the glass splashback with the hand painted, blue shaker kitchen units to keep the shade of blue consistent across the kitchen. Whilst on site, we spotted that the light fittings and switches around the home were all brass. To continue the consistency with materials and look, we fitted brass handles in the kitchen. They are the perfect finishing touch for this kitchen and style. 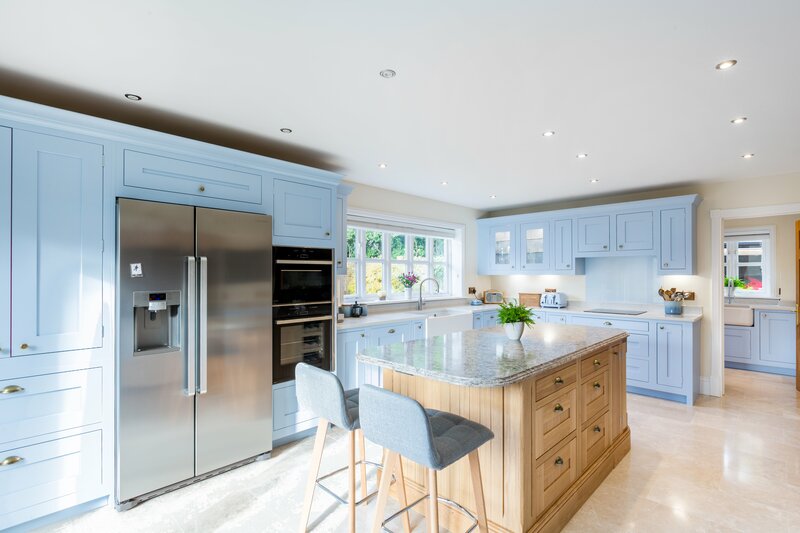 Browse our gallery for some more ideas or pop into our showroom to talk to us about your dreams of a blue shaker kitchen! Drop us a line at info@kitchensbespoke.co.uk to make an appointment.